where can you find us now? Last Wednesday started with ambition and ended with an ER trip. It started with the final order of tongue and groove for the a-frame walls coming two days early. 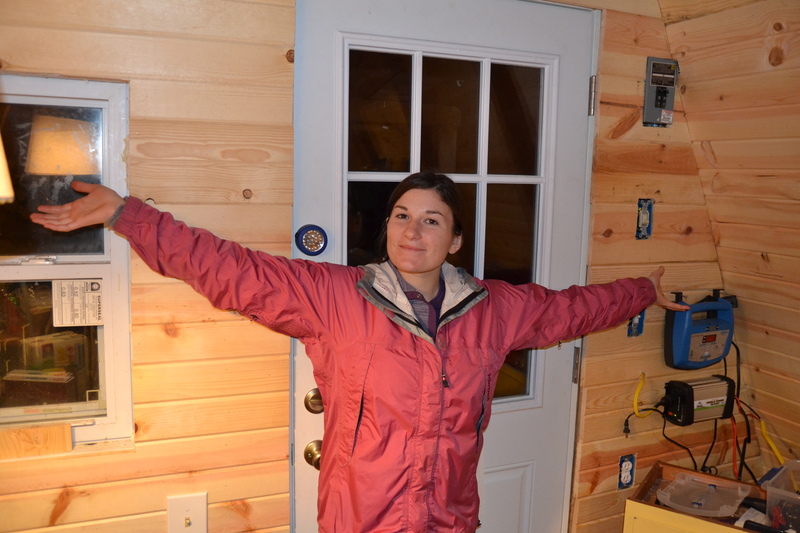 I nearly finished the back wall and then turned to our next problem. 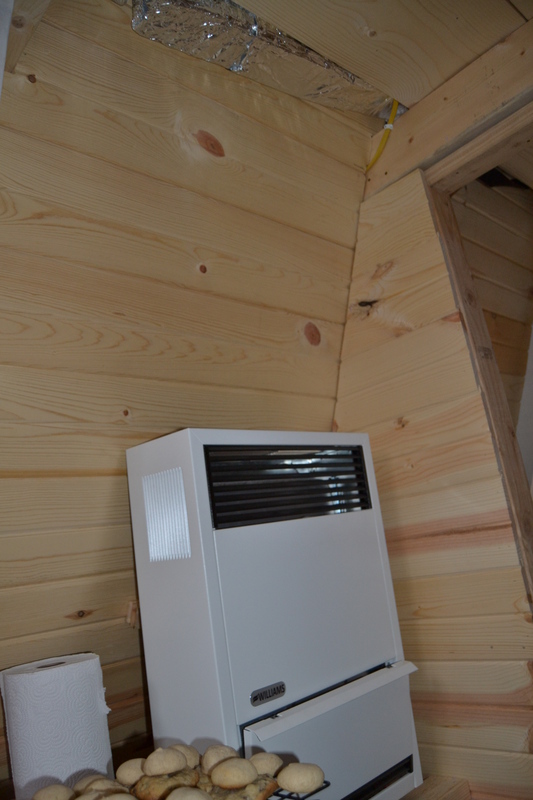 The heater was pumping all the hot air straight up into the loft instead of into the rest of the cabin. Heat rises, straight into the loft which is not where we hang out. Bummer. When I tried to remedy this, I broke the overhead light with my head, raining light shards all over the loft floor. I tried to clean it up with the shopvac only to break a wheel off that. I gave up. When I tried to tackle it again, I forgot the dustbuster down below. I started to descend the ladder to retrieve it and then I wasn’t on the loft anymore. I remember thinking on the way down that this was going to be bad. I hit my head and neck. I smashed my thumb. I did not lose consciousness. If I stood up I was going to pass out and then I’d be in real trouble. I knew what had happened was bad and that I was hurt enough to require a hospital visit. I was alone and felt sure I couldn’t get myself there. I’m glad I didn’t try based on the rest of the afternoon! I sat on the floor exactly as I landed and looked around. The ladder was smashed against the stove and the chair down below. I imagine I hit my head on that. I saw my phone on the table and slid my way over there. I called Bryan, leaving a message I’m glad he didn’t listen to before realizing that I was okay. He would have panicked because I didn’t sound real hot. When he didn’t answer, I did what all good daughters would: I called my mom who lives approximately 16 hours from me. It’s silly, but I’m glad I did because I was really confused, had sparkles in my vision, and wasn’t sure I’d make good decisions. I’m lucky she answered because she called my insurance, helped me figure out if I needed an ambulance, and called our friends who live a few miles away to come to my rescue. My thumb was already black and blue, my face and my entire right hand was tingly, and I was really scared that I’d pass out before Elsa and Matt could come to get me. It felt like hours before I looked up to see Matt’s face peering through the door. I remember them gingerly helping me to their truck and having to have them repeat any questions twice before I could even try to answer. Sometimes I know I still didn’t answer coherently and it took a lot of effort to make sense of what I was being asked. The next thing I remember is Bryan walking in. He says I smiled a big grin and then just started sobbing. Sounds about right. They did xrays and a cat scan. They likely found a fracture in the tip of my thumb and based on how it looks like a mutant’s thumb, I’d say it’s broken. They figured based on the still-there bump on my head and my utter confusion at the hospital that I got a mild concussion. So basically I did a flop right backwards off the ladder and I’m feeling pretty lucky that I didn’t really mess my back up and end up having another winter like last year! Whew! 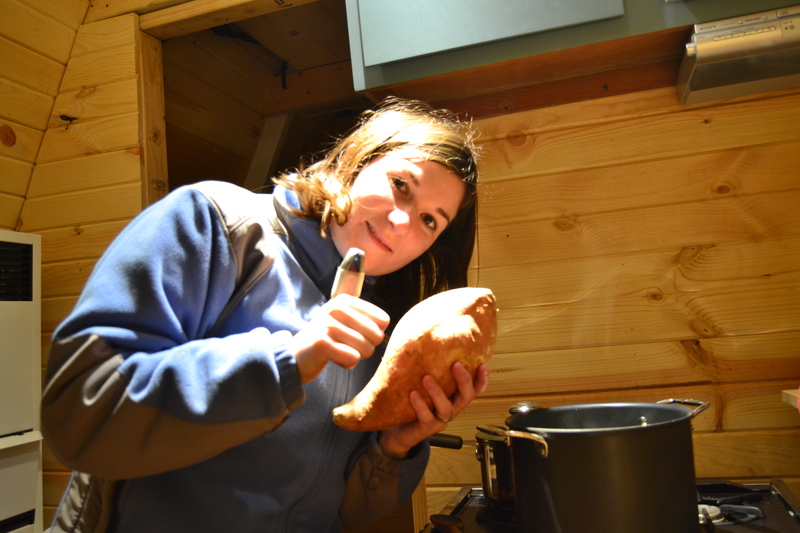 GIGANTIC sweet potato and really special thumb brace. So, because of that little fiasco, I wasn’t able to work on Thursday or Friday, I have a sweet brace for my thumb and am really appreciating the power of the opposable thumb! 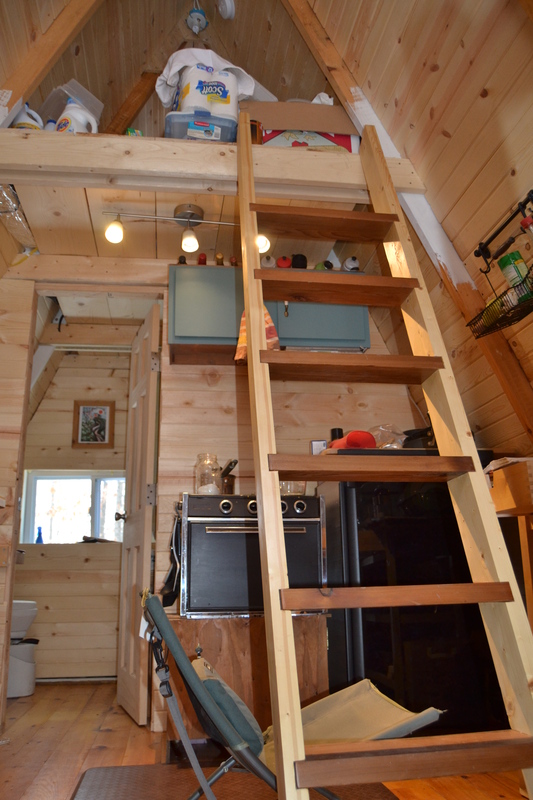 I’m also avoiding the loft in the a-frame and have had to put some projects on hold. In other news though, we FINALLY finished the tongue and groove walls! 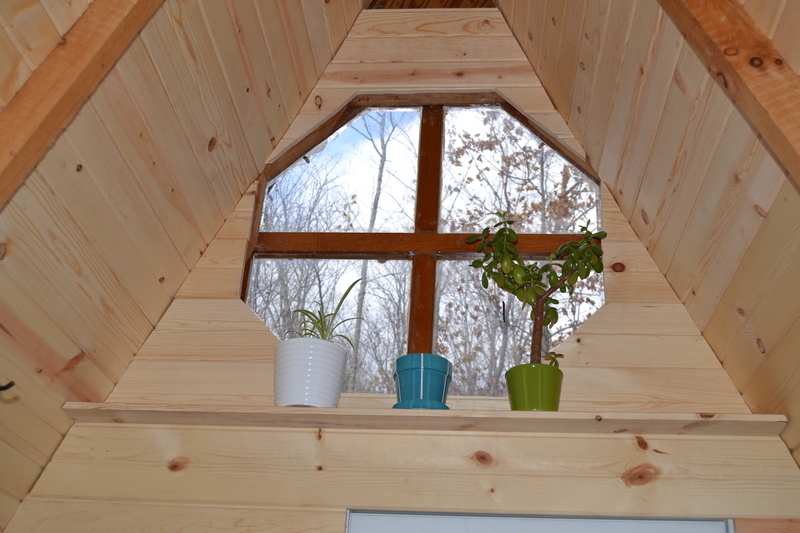 We even added a shelf around the window for my potted plants! FALL! : Porkies Trips, Jess, Lake Lust, etc. my big brother got married!